Under Development Game - Download and Play Free Version! Do you enjoy computer and video games? Of course you do, it’s the reason you’re here in the first place. Have you ever wondered what it would be like if you could develop your own games and actually sell them? If so, then you can finally get a taste of it with Under Development, a game that puts you into the shoes of one aspiring independent developer looking to make his or her big break in the industry. Before beginning your career, you’ll have a chance to create your player character and determine the setting for your working conditions. Put together your own unique avatar! Choose from a wide selection of bodies, faces, hair styles, clothes and accessories. Specialize in up to seven skills vital to game development, including design, programming, 2D art, 3D modeling, sound, music and reputation. Choose the year you want to begin working! Start as early as 1981 or go up to modern times. As your career gets underway, you’ll quickly learn that making games isn’t all sunshine and rainbows. If you want to get anywhere in this business, prepare to face a great number of challenges along the way. Determine the growth of you projects by playing a variety of classic minigames, including Tetris, Block Breaker, Snake, Asteroids, Space Invaders and more! Improve your skills over time. Rent more office space and hire additional help, provided you’ve got the funds. Manage your time and finances. You’ve got expenses to pay and deadline to meet. Fail on either front and it’s game over for your company! 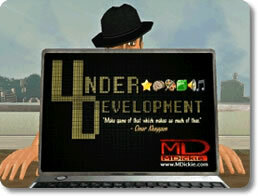 Under Development sets out to provide as authentic an experience as it possibly can. Expect to run into many of the most recognizable icons in the business. Work for a number of real-life companies, including Capcom, Sega, Nintendo and Microsoft. Develop games for many platforms, like the Atari 2600, NES, Master System, Playstation 1-3, Game Boy, PC and Xbox 360. 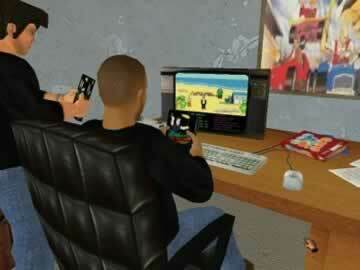 Work alongside and against famous game developers, such as Sid Meier, Shigeru Miyamoto, Hideo Kojima and Will Wright. Gaming changes everyday, both in the real world and in Under Development. Watch history unfold little by little as your company grows. Read up on the latest trends in the industry and plan your business strategy accordingly. Follow the careers of your colleagues. Develop for new consoles and platforms as they become available. Ready to Get Under Development? Under Development provides a mix of simulation and strategy alongside classic games, and wraps it all up in a loving tribute to video games as a whole. Best of all, it’s free and always getting updated! If you’re fascinated with gaming, both as a hobby and as an industry, then Under Development is just what you need.